The Combined Federal Campaign is the world’s largest and most successful annual workplace charity fund drive. There are more than 200 local CFC campaigns throughout the country and internationally. Pledges made by federal civilian, postal and military donors during the campaign season (September 1st to December 15th) total more than $275 million annually which go to eligible non-profit organizations. PLEASE SUPPORT THE INTERNATIONAL WOLF CENTER THROUGH YOUR CFC. If you are a current or retired federal civilian, military or postal service employee, you can support the International Wolf Center through the Combined Federal Campaign (CFC)! 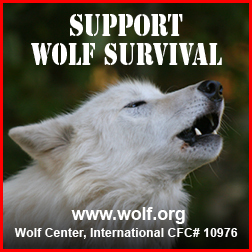 Simply designate WOLF CENTER, INTERNATIONAL (CFC #10976) on your CFC contribution. The International Wolf Center has been awarded by Independent Charities of America its Best in America Seal of Approval. See www.bestcfc.org for details.